Messy shag cuts, asymmetric sideswept fringes, vintage and thrift store tight-fitting jeans and thick rimmed glasses. That’s today’s hipster – the independent-thinking, indie-rock-listening young trendsetter who personifies cool in the modern world. Now, if Mrs Pound is a 20-something lady – and this just what we imagine her to be – then she’s the hippest hipster in town. She’s already regaled us with her street-style food at the PMQ night markets, and she’s finally set up shop in our city. 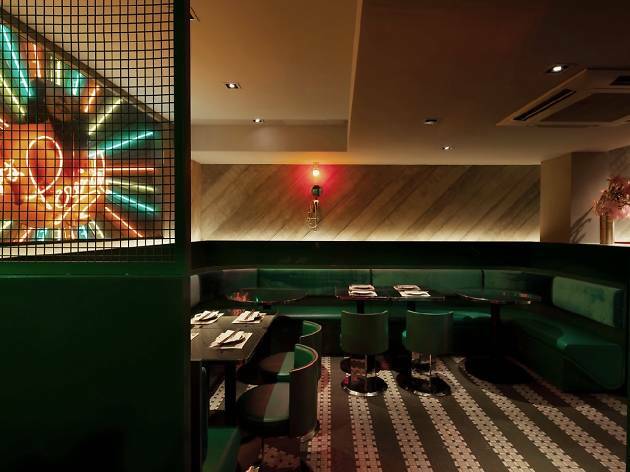 Get ready for something modern and trendsetting in the Hong Kong restaurant scene. 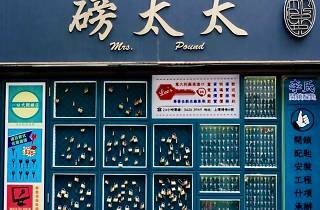 Mrs Pound gives off the hipster vibe even as you stand in front of the Sheung Wan restaurant, looking for the way in. She’s trying something new. Something really, really cool. She’s too hip to even look like a restaurant. 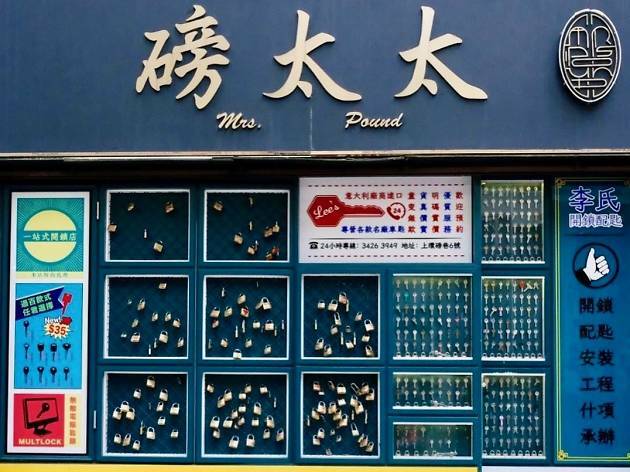 Instead, she’s hung a sign up saying Mr Ming’s Stamp Shop and she displays rows of stamps in her windows [Editor: As of 2018, the exterior of Mrs Pound is now a locksmith’s shop]. There’s no clue this is an eatery at all. It’s not until we use our observation skills, find a secret switch to open the door and step inside do we find this isn’t a stamp shop at all. Seriously. How cool is that? 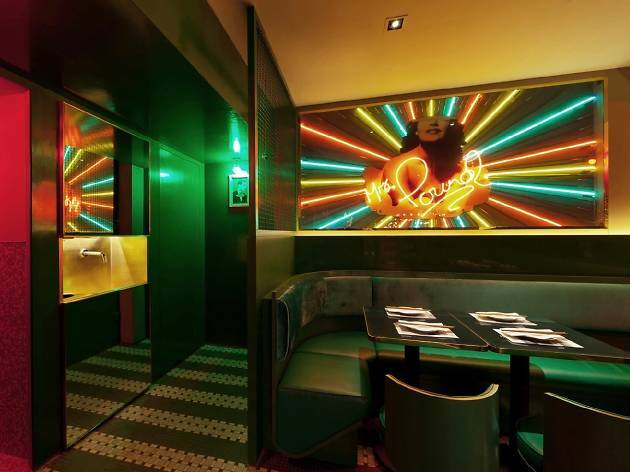 The façade gives way to a décor that’s a cross between a burlesque dressing room and the Peach Pit restaurant in Beverly Hills 90210, complete with a compact mirror mural on a pink wall and turtle green leather-backed booths. And it’s here we learn about Mrs Pound. 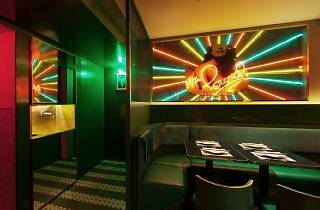 She’s a burlesque dancer who ran away with her true lover – Mr Ming – to Hong Kong. He gave her his stamp shop and she turned it into a restaurant, hidden behind closed doors and touting her innovative interpretations of Asian cuisine. Okay, it’s a ridiculous story – but it does create a strange, otherworldly-yet-almost romantic ambience and sets (dare we say it again) an off-the-wall, cool, hipster vibe. Yeah, so Mrs Pound is probably just named after the street she resides on. So what? Even before we sit down we’re already enjoying one exciting dining experience. Mrs Pound’s menu is simple and straight to the point, as we expected it would be. Skewers, small plates, bigger plates and desserts. We dive in and first to arrive is the bulgogi pork belly skewer ($38), which combines insanely juicy meat with the cool taste of fresh shiso leaf and one of the best sweet bulgogi sauces we’ve had outside of Korea. It’s an instant smash. We also tuck into the Sriracha street corn ($58), a corn cob served with cheese and kelp and sprinkled with hot sauce. It packs a spicy kick that dissipates quickly, leaving a pleasant sweeetness on the palate. This strong start is then followed up by the rendang baos ($45). Wow. We never thought sweet curry would work so well with char siu sauce in a bun. And the baos themselves! Served in a neat individual steamer, the bready texture is silky smooth and fluffy, working wonders with the beef. This dish surpasses even the best dim sum restaurants in Hong Kong. For something more substantial, we next plump for the Hainan chicken ($148) and Mrs P’s chilli crab ($468). The bird, with its silky smooth texture and skin that’s been soaked so it has a chilled layer of gelatin between the meat, is just the right amount of fat. Served in a bowl of chicken stock rice, the starch filler is fragrant not only from the broth it’s cooked in but also by the choice of using broken rice grains. There’s a nuttier taste and stickier texture. Mrs Pound (or, at least, her chef) pays an extreme amount of attention to detail when it comes to the selection of ingredients. For a dish like Hainan chicken, the choices are perfect, right down to the last grain of rice. And the three sauces served with this iconic dish are also perfect, balancing sweet, sour and salt tones. The crab arrives piping hot just like it does at a traditional dai pai dong and the sauce is a cross between a tangy Thai spice one and a thicker, sweeter Chinese black bean variety. Damn, it’s good alongside the fall-apart crab meat. We get so caught up with it that we order extra bread to mop up all the juices. The one downer of the evening happens at dessert-time. Mrs Pound runs out of her ice cream sandwiches. Not to be deterred, we try a piece of the Thai tea cake ($50). It’s deliciously moist and tastes exactly like the orangy cousin of Hong Kong milk tea – light in flavour and tangy. A stronger type of tea may stand out more on the palate but, hey, that’s nitpicking. 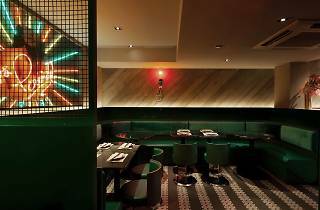 Mrs Pound, 6 Pound Ln, Sheung Wan, 3426 3949; mrspound.com.